Children at Sompting Abbotts School have received an amazing glimpse into the life of an international musician. 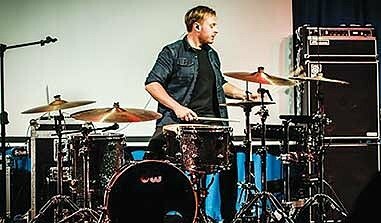 It came from former pupil and chart-topping Two Door Cinema Club drummer Ben Thompson who returned to the school for an assembly visit. Ben started his drumming career tapping out beats on his school desk at Sompting Abbotts Preparatory School, near Worthing, where he was a pupil from 2000 to 2005. 'My proper introduction to music was at the school. I was always tapping on the desk and irritating the teachers!' he told the children. 'I remember Head of Music Mrs Williamson suggesting I try some drum lessons. I thought she was joking but she wasn’t.' Ben also learned piano and guitar at the school. He told the pupils that it was both grounding and wonderful to return there and talk to them. 'Coming back to the school and being back here in the Assembly Room that I first performed in brings you back to earth! It’s crazy to think that aged 9, I was performing in front of parents and now I play in front of 80,000 people at Glastonbury,' he said. Today, he’s still tapping! Ben (27) is now a professional drummer with award-winning Indie Rock band, Two Door Cinema Club. He's also an in-demand session musician for big names the world over. His percussion skills have taken him across the globe to play in major venues in the US, Asia and Africa. In the UK, he’s played everywhere from the O2 to Glastonbury and at major music festivals including Reading, Leeds and Latitude. Email: office@somptingabbotts. com Sompting Abbotts Preparatory School, Church Lane, West Sussex, BN15 OAZ. Tel: 01903 235960.